Abstract: Some Indian states have announced farm debt waivers recently, which bear ramifications for the fiscal burden of states over the medium term. Empirical estimates suggest that fiscal deficit can have an inflationary impact. In particular, impact is non-linear as fiscal deficit causes inflation to rise more at higher level of fiscal deficit and inflation. If the combined fiscal deficit for 2017-18 goes up by 40 bps on account of farm loan waivers(both actual and intended), with the budgeted combined fiscal deficit at around 5.9 percent for 2017-18 and inflationary momentum remaining benign, ceteris paribus, this may lead to around 20 bps permanent increase in inflation, starting 2017-18. In India, farm loan waivers have been announced intermittently by both the central and state governments to provide relief to farmers facing distress due to natural calamities / crop failure. 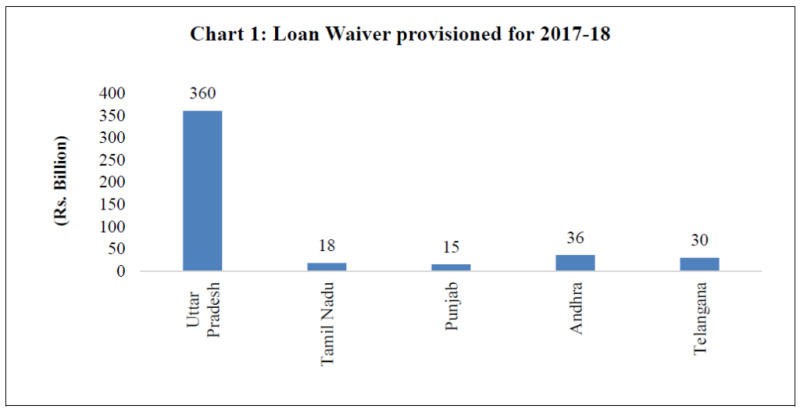 Recent instances of such waivers include the Agricultural Debt Waiver and Debt Relief (ADWDR) Scheme announced by the central government in 2008 and state-specific farm loan waivers announced by Andhra Pradesh and Telangana in 2014; Tamil Nadu in 2016; and Uttar Pradesh (UP), Maharashtra, Punjab and Karnataka in 2017 (so far). It is also pertinent to note that random fiscal policy shocks, such as loan waivers, have an enduring impact on market borrowings, as evident from past episodes of such waivers. If overall government borrowing increases, yields on state development loans (SDL) may firm up posing higher interest burden for the states in future. Concomitantly, they can also crowd out private borrowers as the general cost of borrowing increases with pressure from higher government borrowing on the finite pool of investible resources in the economy. Thus, state government farm loan waivers have the potential to crowd out corporate borrowings if financed through SDL issuance. We examine the short-run as well as long-run impact of combined GFD to GDP ratio on CPI inflation by incorporating the possible non-linearities of the impact of fiscal deficit on inflation. The choice of the number of lags of the dependent and the independent variables is based on the overall model properties and the regression diagnostics. The results of the bounds test with Π1 as the dependent variable (equation 1) and with X1 as the dependent variable (equation 2) are given in Table 1. With Π1 as the dependent variable, the F statistic is above the upper bound of the critical value at 1 per cent level, suggesting that the null hypothesis of no cointegration is rejected. While with X1 as the dependent variable, the F statistic is below the lower bound of the critical value indicating no cointegration. These results indicate that inflation, in the long-run, is significantly influenced by combined fiscal deficit. The slope coefficient dΠ1/dX1 is 0.017, which is the change in Π1 (which is log(1+ Π)) when X1 (which is = (X2)/2) changes by one unit. However, the coefficient of our interest is the change in inflation (Π) when fiscal deficit (X) changes by one unit, which can be deducted as 0.017*(1+ Π)*X. This shows that the change in inflation induced by a unit change in fiscal deficit is dependent on both the level of inflation as well as the level of fiscal deficit. In other words, this indicates that at higher levels of inflation and fiscal deficit, the impact of fiscal deficit on inflation will be higher. 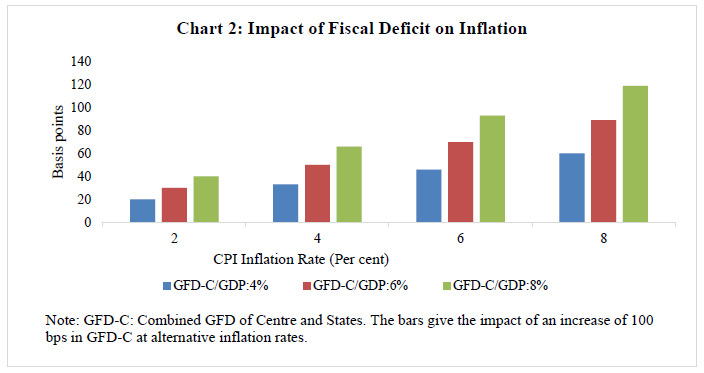 Equation 3 can be used to estimate the impact of one per cent increase in GFD-C on CPI inflation (in bps) at different levels of inflation and fiscal deficit (Chart 2). The empirical results suggest that there exists a positive and statistically significant long-run relation leading from fiscal deficits to inflation in India which is non-linear in nature, i.e., the impact of fiscal deficit on inflation will be higher at higher levels of the fiscal deficit and inflation. To summarise, if the combined fiscal deficit for 2017-18 goes up by 40 bps on account of farm loan waivers, with the budgeted combined fiscal deficit at 5.9 percent for 2017-18 and inflationary momentum remaining benign, ceteris paribus, this may lead to around 20 bps permanent increase in inflation, starting 2017-18. 1 Pratik Mitra is Director, Joice John and Asish Thomas George are Assistant Advisers in the Monetary Policy Department. Indranil Bhattacharyya is Director and Indrani Manna is Assistant Adviser in the Department of Economic and Policy Research. The findings and views in this paper are entirely those of the authors and should not necessarily be interpreted as the official views of Reserve Bank of India. 2 The Hindu Business Line (June 12, 2017), The Indian Express (June 13, 2017), India Spend (June 15, 2017) (http://www.indiaspend.com). 3 In practice, the Government pays the bank who, in turn, absolves the borrower of repayment obligations. 4 One basis point is one hundredth of a percentage point. 5 Leeper (1991), Sargent and Wallace (1981) and Catao and Terrones (2005). 6 Two or more time series variables are said to be cointegrated if some linear combination of the component variables is stationary. An ARDL cointegration approach also called as bounds test by Pesaran et al. 2001, is a test for cointegration among series integrated of different orders, I(0) or I(1) and is employed to investigate the short-run dynamics and long-run relationship. The bounds test approach is used whenever the order of integration of the variables under consideration is different, which is what we observe in our study. If the calculated test statistic (F value) falls below the lower bound of the critical value, the no cointegration null hypothesis cannot be rejected. If the F-statistic exceeds the upper bound, the null of no cointegration is rejected. Further, if the F-statistic falls in between, the test is inconclusive. The critical values of the F statistic given in Pesaran et al. (2001) are for large sample size. Therefore, the critical values for small sample size provided in Narayan (2005) are used. 7 Proportional Denton method is used for interpolating a low-frequency time series by use of an associated higher-frequency proxy variable, imposing the constraint that the estimated series at higher frequency follows the original low-frequency series totals. 8 The variables – annual combined fiscal deficit, quarterly central fiscal deficit, consumer price index (CPI) combined, quarterly nominal GDP at market prices, quarterly real gross value added (GVA) and exchange rate are collated form Database on Indian Economy, Reserve Bank of India. The Indian basket crude oil price is sourced from the website of the Petroleum Planning & Analysis Cell, Ministry of Petroleum and Natural Gas, Government of India. The backdated CPI prior to 2011 are extracted from RBI (2012). Catao, L. A., and M. E. Terrones (2005). Fiscal deficits and inflation. Journal of Monetary Economics, 52(3), 529-554. Leeper, E. M. (1991). Equilibria under ‘active’ and ‘passive’ monetary and fiscal policies. Journal of Monetary Economics, 27(1), 129-147. Pesaran, M. H., Y. Shin, and R.J. Smith (2001). Bounds testing approaches to the analysis of level relationships. Journal of Applied Econometrics, 16(3), 289-326. Sargent, T. J. and N. Wallace (1981). Some unpleasant monetarist arithmetic. Federal Reserve Bank of Minneapolis Quarterly Review, 5(3), 1-17.